Sydney, Australia (LiveActionNews) — A premature newborn in Australia, born along with his twin sister at just 27 weeks’ gestation and weighing in at only two pounds, was pronounced dead by his physician after medical staff tried for twenty minutes to revive him. Jamie Ogg, now a little over three years old, is alive today only because of the undying love and affection of his mother. According to the U.K.’s Daily Mail, when Jamie was pronounced dead, the doctor handed him to his mother, Kate, so that she could say goodbye to her son. Kate took Jamie into her arms and tearfully caressed her tiny son. She and her husband spoke to him, telling him what his name was, and that he had a sister. She told him the things that she had wanted to do with him throughout his life. Kate held Jamie on her chest, skin-to-skin, and occasionally he would gasp – a reflex the doctor said was normal after death. But Kate held on to Jamie for two hours, cradling and talking to him, and slowly she witnessed him beginning to show signs of life. 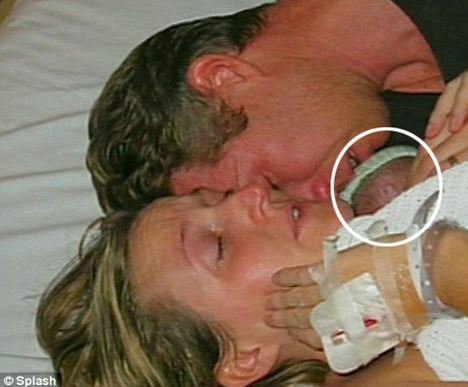 Jamie’s parents Kate and David Ogg embrace their newborn, pronounced dead by his physician shortly before. Jamie began gasping for air more frequently, and then Kate gave him a little breast milk on her finger. The baby took the milk, and then he opened his eyes. Her stupefied doctor stood next to the bed, astonished and in disbelief. It was a miracle, and it has been wholly attributed to the faithfulness of a loving mother who, although there was no reason to believe that her son would come back to life, still showed him all of the love she had within her. Kate Ogg, Jamie’s mother, smiles as she cradles her live baby after bringing him back to life with skin-to-skin contact and plenty of maternal affection. Jamie was fortunate to have a mother like Kate, who did not give up on him even when his survival was pronounced futile by his physician. Unfortunately, many pre-born children, who are diagnosed (sometimes inaccurately) in utero with any range of genetic or chromosomal abnormalities, are not given the chance to fight for life in the loving care of their parents. Instead, they are aborted. If we spread the word about miracles like the life of little Jamie, perhaps more parents will be encouraged to give their little ones a chance at survival and a long, healthy life. LifeNews Note: Lauren is a Legislative Associate for Texas Right to Life and a graduate of Ave Maria University. This post originally appeared at LifeActionNews.